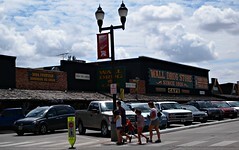 You really can't bypass Wall Drug if you find yourself in the Badlands or traveling to Mount Rushmore. It's nearly unAmerican to do so. Once a humble drug store, Wall Drug lured customers to their humble shop during the 'dirty 30s' with free ice water and 5 cent coffee. Offers which remain to this day. But now you'll also find plenty of prairie kitch- a 10 foot tall jackalope, roaring T-Rex, covered wagon, and mini Mount Rushmore, all perfect for photo opps. The drug store itself still remains, but is now surrounded by a huge "mall" filled with souvenirs of all types - fossils, western garb, presidential trinkets, Native American artifacts.... Definitely worth a stop, if only to grab a "Have You Dug Wall Drug" bumper sticker. Very busy in the summer months- up to 20,000 visitors a day!- so if you plan to eat, be prepared to wait. Lots of free fun in the 'backyard'- you just have to get past the stores first! This unlikely roadside stop is an internationally famous must-stop and a mega-tourist trap in the best possible way. It's historic, and a genuine slice of Americana. Opened during the Great Depression in the middle of nowhere, the drugstore did little business until the owner started advertising free ice water and 5-cent coffee to travelers en route to Mount Rushmore. Today it's a $10-million-a-year business that's sprawled into a store, coffee shop, and general emporium. 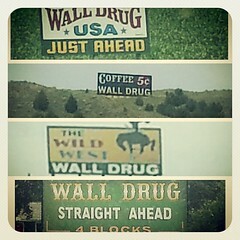 The billboards for Wall Drug that line the highways in South Dakota are legendary. Buy the t-shirt. We had a lot of fun with the kitschy souvenirs here -- they make great gifts and have a ton of retro street cred. The shirts sporting the famous Wall Drug "jackalope" are conversation starters all over the world. My kids have been stopped in all sorts of places--from Yellowstone to city airports--by travelers who know and love Wall Drug.